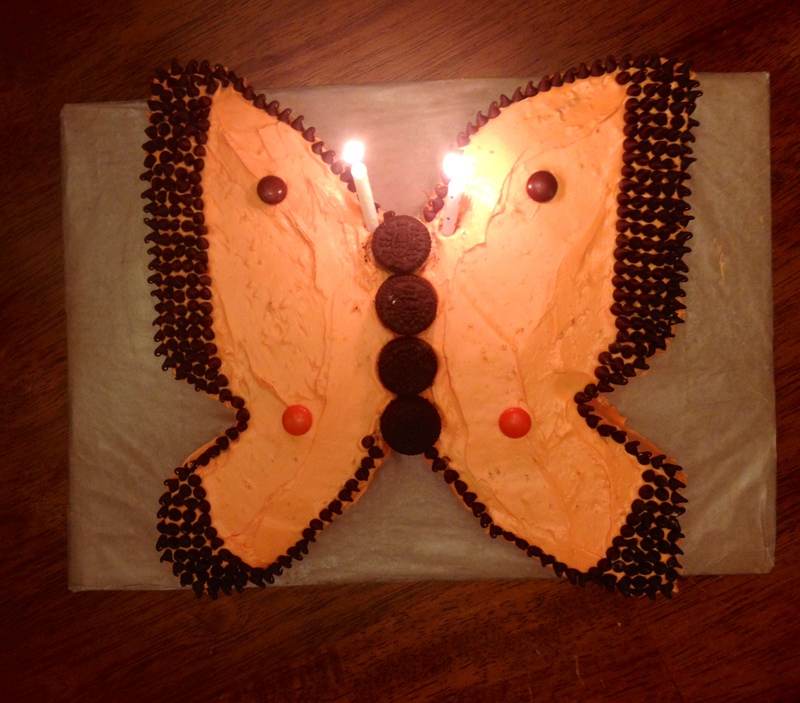 So here at butterflies and science we like to have fun and enjoy delicious baked goods too! Not only are the members of our lab scientists, but they are fantastic bakers and cake decorators as well. Yesterday we celebrated Heidi’s birthday and our fellow lab member Kate made this amazing cake! It’s a pretty good looking male Colias cake! I personally love the Oreo cookie body. 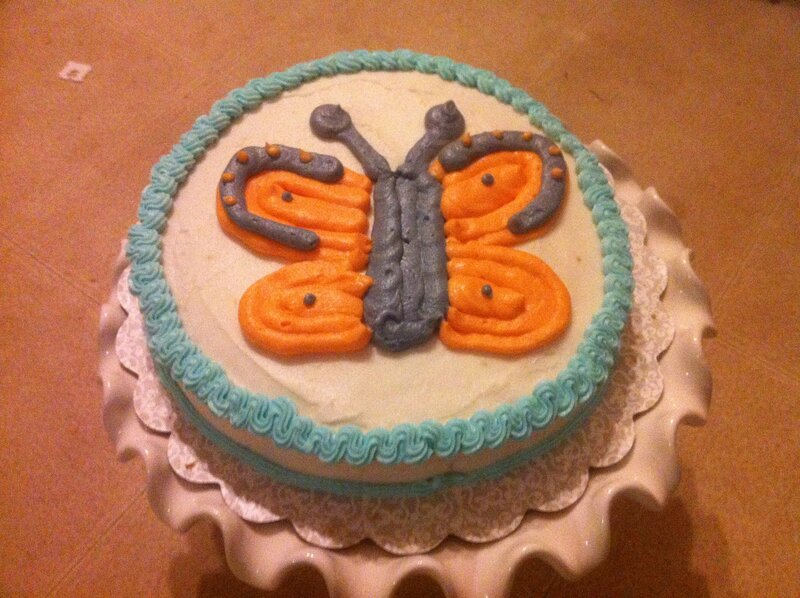 I’m seriously impressed and it’s a much more intricate cake cutting design that my previous female Colias cake which was mostly frosting (tasty, delicious frosting). So in case you were wondering we really do eat, sleep, and breathe butterflies over here! Climate change is wrecking havoc on these beautiful butterflies. So things aren’t looking great for arguably one of the most recognizable and favorite butterflies. Monarchs are migratory butterflies and they spend the winter in Mexico (unlike your grandparents who winter in South Florida). During their winter siesta the monarchs aren’t just sipping away on margaritas they spend their time roosting, where they literally hang onto the tree branches and trunks. These monarchs typically chill out and roost in the Oyamel fir forests and enjoy the moist clouds at about 3000m (~9800ft) above sea level. What scientists and conservationists have found is that the roosting area has decreased dramatically this year. Normally the roosting butterflies take up an area of 3-7 hectares, but this year the roosting area is just a measly 1.19 ha (~4.6 acres). So what are some of the reasons why the numbers are declining? 1. Hot temperatures. Remember how stinking hot it was last spring and summer? I certainly do as I was 7-9 months pregnant and here in NC it was hot, hot, hot! The same was true for the rest of North America and hot temperatures mean bad things for caterpillars. Because it was so warm so early the butterfly breeding season was all out of whack. Once the temperature gets over 95F the eggs and caterpillars die, and even at lower temperatures the eggs can dry out. This is actually something that I study in my very own Colias caterpillars and I’ve seen first hand how changes in temperature can change growth and development in caterpillars. 2. Loss of available host plant. Monarch caterpillars feed on milkweed which was commonly found in corn and soybean fields. An increase in herbicide use and genetically modified corn and soybean (that can survive herbicide spraying) has decreased the amount of milkweed available by over ~50%. There was also a large increase in corn and soybean farmlands that replaced meadows and some conservation lands. Overall, this is a massive loss of habitat, and the monarchs just can’t find enough food. 3. Loss of winter roosting sites. As mentioned earlier the monarchs roost in fir forests and in these forests there have been reports of illegal logging. Luckily the Mexican government is now working hard to make sure these sites are protected and thus saving the monarchs’ winter home. Some scientists are concerned that we may have reached a critical low in monarch numbers from which the population may not be able to bounce back. Right now we don’t know, only time will tell how the monarchs will respond to this population setback. It’s stories like these that make me glad that I study climate change and butterflies. While the Colias aren’t in danger of extinction they have certainly responded to climate change in interesting ways (stay tuned for more on my research!) and we are only now starting to understand how increased future climate change could affect them. For more information about the monarchs and to see what you can do to help check out Monarch Watch! Plants and fungi look like peaceful woodland scenery, but underneath the soil some plant-fungi pairs act as a deadly team mummifying insects and draining them of their nutrients, according to a new paper published in Science. The study by Canadian grad student Scott Behie and his research group, shows that the soil fungus Metarhizium can parasitize soil insects and deliver their nitrogen to it’s symbiotic plant partners. While soil bacteria often break down dead insects, this is one of the first examples of a fungus specifically targeting living insects for their nutrients. Plants and fungi have a long history of cooperation; plants need nitrogen, but only certain types of nitrogen-based molecules will do. Plants often get around this problem by forming symbiotic relationships with fungi that can convert nitrogen into biologically useful forms, sometimes even allowing the fungi to live inside their root cells. 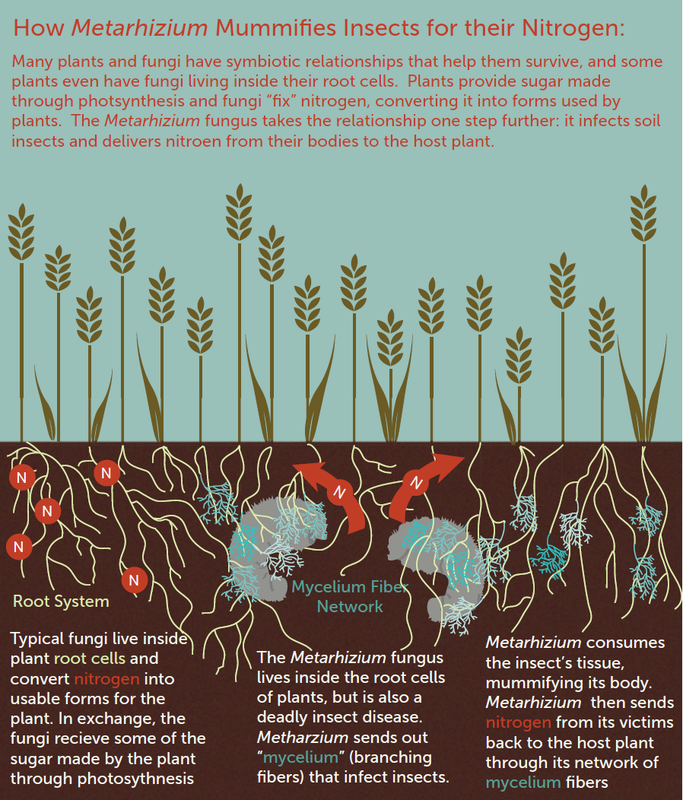 In return, fungi get some of the sugars that the plants produce through photosynthesis. However, Metarhizium and it’s plant partners take things a step further: in addition to converting nitrogen into plant friendly forms, Metarhizium is a also deadly insect pathogen. When an insect is infected with Metarhizium the fungus quickly consumes the insect’s tissues from the inside out, mummifying it within a few days. It now seems that Metarhizium is sharing it’s insect prey with it’s plant host. Behie and his research team wanted to find out whether the fungus was specifically targeting insects to share with it’s host plant, or whether the insect infection was unrelated. 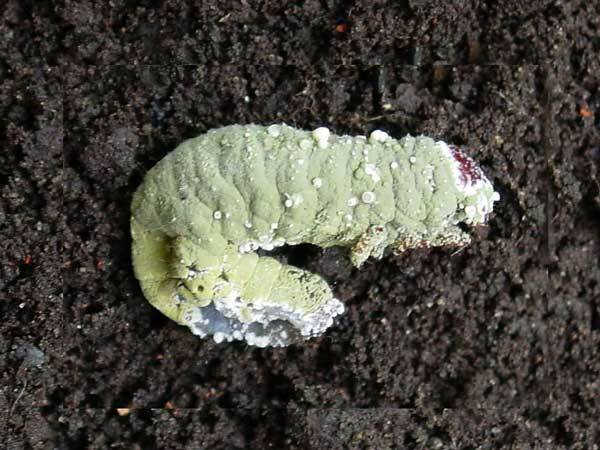 To test this, Behie injected waxmoth larvae with a special type of traceable nitrogen, called Nitrogen-15 . He then infected some of the caterpillars with Metarhizium and left some healthy. He then put some healthy and infected insects in pots with plants (common beans and switchgrass) that have symbiotic relationships with Metarhizium . After a month, he tested the plant leaves for the Nitrogen-15 from the caterpillars. He found that in plants that had infected caterpillars had 40 to 50% more Nitrogen-15 than those with healthy caterpillars. The Nitrogen-15 injected into the caterpillars had found it’s way into the leaves in just a few weeks. However, it is possible that the Metarhizium–infected caterpillars died more quickly than the healthy caterpillars, and simply released their Nitrogen-15 as they decomposed. To confirm that the Metarhizium was actually transferring Nitrogen directly from the insects to the host plant, Behie did a second experiment with another insect pathogen (Aspergillus flavus) that did not have a symbiotic relationship to plants. Plants with the non-symbiotic fungs had only tiny increases in Nitrogen-15 , no different from the increases found in plants without fungus at all. Only plants that had Metarhizium were able to gain Nitrogen-15 from the insects. The discovery that Metarhizium can both kill insects and aid plants is exciting to agricultural scientists. Metarhizium is used as a natural pesticide to protect crops from insect pests. However, it now seems like it might also be natural fertilizer too, converting once deadly pests into a useful source of nutrition for plants. Since Metarhizium is an incredibly common fungus, found all over the world, it’s likely that there may be some underground mummifcation going on in your back yard. Climate change is reviving a once rare British butterfly, according to a new article in the journal Science. The brown argus butterfly was once scarce, but has doubled the size of its range in the last 20 years. 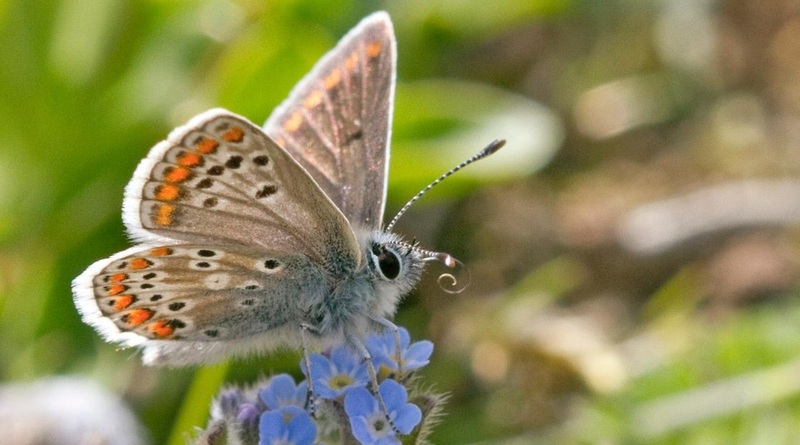 The study, authored by biologists at the University of York, indicates that at warmer temperatures brown argus butterflies are able to feed on more common plant species, allowing them to expand into new territory. Brown argus caterpillars normally feed on the rockrose plant, but they occasionally use plants in the geranium family during warm summers. The rockrose usually lives on sunny, south facing slopes and brown argus caterpillars depended on these warm microclimates for survival. However, for the last 20 years summer temperatures have been on the rise and the brown argus has been shifting it’s egg laying towards geraniums. To test whether climate caused the shift in food choice, lead author Rachel Pateman and her colleagues used data collected from 200 sampling sites in southern England. Butterfly sightings at the sampling locations were reported by volunteer naturalists, and some sites been monitored since the 1900s. Each sampling location had only rockrose or only geranium growing nearby. The researchers used butterfly counts from the volunteer records and matched it to historical temperature data. They found that the butterfly populations grew faster at geranium-only sites during warm periods, and faster at rockrose sites in cool years. The brown argus has nearly doubled the size of its range in the last 20 years. Dark red and blue are locations where it was found prior to 1990, the light blue and pink circles indicate new territory gained in the past two decades. 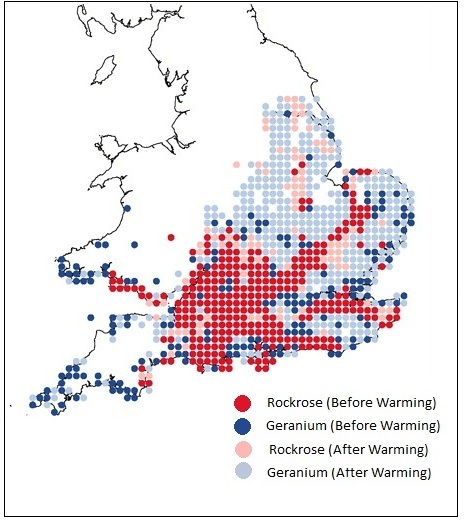 Most gains have been in areas where geraniums are found. While climate change has been an unexpected bonus for the brown argus, it’s unlikely to be such a boon for other species. According to Stanford biologist Terry Root (who was not involved in the study), for every species that turns out to be a climate change “winner” there are expected to be three “loser” species that suffer population declines or go extinct. Hello fellow butterfly enthusiasts! It has been a long time since I’ve posted, but we are almost at the 1 year mark for the blog! Things have been really busy here for me. I finished all of my analysis from my experiments last summer and I have already started doing experiments this summer. Also on a personal note my grad student husband and I are expecting a baby girl by the beginning of September. We’re both really excited and luckily the pregnancy hasn’t slowed me down too much. Here’s a picture of me after catching Colias butterflies here in North Carolina last week. Catching butterflies 6 months pregnant. So when I last left you I was analyzing mountains of data. That is mostly finished and I’d love to tell you all about my results, but I can’t do that just yet. Here’s the reason why. In science when you finish an experiment you need to write it up in the form of a scientific paper and submit it to a scientific journal. This paper goes through a process called “peer review” before it becomes available to read. Peer review means that the paper is scrutinized by other scientists in your field for scientific errors and inaccuracies. Often times there are three reviewers per paper and they are looking for things like: “Was this a valid way to conduct the experiment?”, “Is this experiment repeatable or just random?”, “Is this researcher making claims that are not supported by their data?”, etc. They also check the paper for things like general readability, length, and making sure all the graphs and figures are easy enough to understand. Each reviewer can then accept the paper, accept the paper with revisions, or reject the paper. Rarely are papers accepted right away without having to make some revisions. Once each reviewer has made a decision about the paper, an editor from the scientific journal makes a final decision. If it gets rejected you can fix some of the issues that the reviews had and resubmit the paper to another journal. If it gets accepted with revisions, you get to make those revisions and then in a few months your paper gets published! It’s a long process, but a thorough one, and the it aims to make sure that there are no inaccuracies in science. Peer review is not a perfect system, sometimes bad experiments get published, and the process itself is long and can seem drawn out, but it’s the best we have for now. It’s like fact-checking an article in the newspaper. You want to be able to trust that the news is unbiased and reporting the facts. It’s the same way in science. Politicians make policy decisions and doctors make medical decisions based on scientific research. Also as most of the science down in this country is funded by the federal government through the National Science Foundation or the National Institute of Health, scientists have a responsibility to report the facts to the taxpayers. It’s always big news when a scientist has been committing data fraud and it can be grounds to lose your PhD! However, most scientists are honest and only report true data. It makes sense when you think about why many people became scientists in the first place. They liked asking questions and discovering the answers. When scientists make up fake results they are cheating themselves out of making actual discoveries. So that in a nutshell is peer review, and it’s one of the reasons why even though I’m SUPER excited about my results from last summer, I can’t share them with you yet. I wouldn’t want to make any scientific claims that haven’t been “fact checked” by other scientists yet. Hopefully this fall I will start writing these papers so that soon they will be published and I can talk all I want about them here on the blog! I promise my next blog post will be sooner rather than later and with more pretty butterfly pictures! Also, as a shameless plug check out this sweet Q&A article in the Raleigh News and Observer about the blog and why Sarah and I started it. 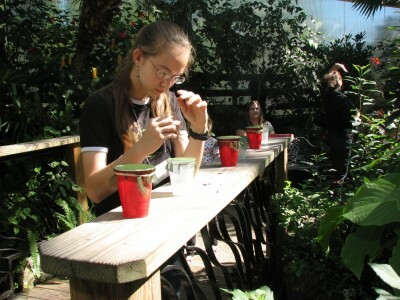 Alexandra Sourakov has logged hours of research at the University of Florida’s butterfly house. She used a combination of behavioral experiments and electorantennography (measurements of electrical current in butterfly antennae) to determine how butterflies find food. 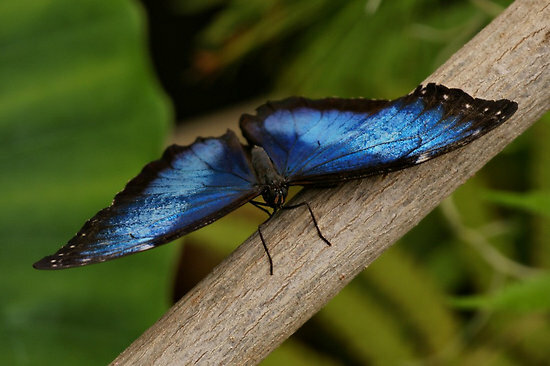 Her most recent paper on foraging in Blue Morpho butterflies appears in this month’s edition of Psyche – Journal of Entomology. Alexandra Sourakov is also about to finish her sophomore year of high school. Sourakov began her study as part of an eighth grade science project. She used the butterflies in the University of Florida Natural History museum’s butterfly house to see whether flower-feeding and fruit-feeding butterflies responded differently to color. Sourakov used different colored landing pads baited with food to see whether butterflies preferred brightly colored surfaces to black. She found that flower- feeding butterflies were attracted to bright hues, but that fruit-feeding butterflies were indifferent to color. Presumably, flower-feeding butterflies evolved to respond to color cues because they aid in finding brightly colored flowers, while fruit-feeding butterflies usually feed on fruit that has fallen to the dark forest floor, where visual cues would be of little use. After winning the science fair, Sourakov decided to scale up her research program to investigate how the fruit feeding butterflies found their food. If they weren’t using color, how did they find fruit? Partnering with USDA researcher and science fair judge Adrian Duehl, she launched a multi-faceted approach to understanding butterfly foraging. Sourakov and Duehl used gas chromatography to determine what chemicals in rotting fruit might be attractive to butterflies. They applied these chemicals as volatiles to the antennae of Blue Morpho and Owl butterflies. These two fruit-feeding species did not show any preferences for color during the experiment. With the help of electrodes, they measured the electrical output when the butterfly was exposed to different chemicals. They found that several chemicals that give bananas their distinctive odor provoked a response in the butterfly antennae. Even more interesting, they found that it wasn’t only the antennae that registered a response of the chemical, the legs and proboscis (feeding tube) also responded to the scents. The labial palpi (mouth parts on a butterfly’s head below the antennae) reacted to a different set of chemicals, indicating that butterflies may use multiple organs to detect a variety of odors. Spring has been coming early to the Rocky Mountains, and while warm weather may be good news for humans, it’s bad news for flowers and butterflies. A long term study by Carol Boggs (Stanford University) and David Inouye (University of Maryland) shows that early snowmelt causes a decrease in flower populations, which in turn means reduced food for the mormon fritillary butterfly. In years where the snow pack melted early, spring frosts often damaged newly emerged plants, and the butterfly’s preferred flowers became scarce. Caterpillars were also casualties of this early spring thaw; butterfly larvae emerged before the danger of frost had passed and were often victims of sudden freezes. The Rocky Mountains are warming faster than other parts of the country, so the effects of early snow melt are expected to worsen in coming years. 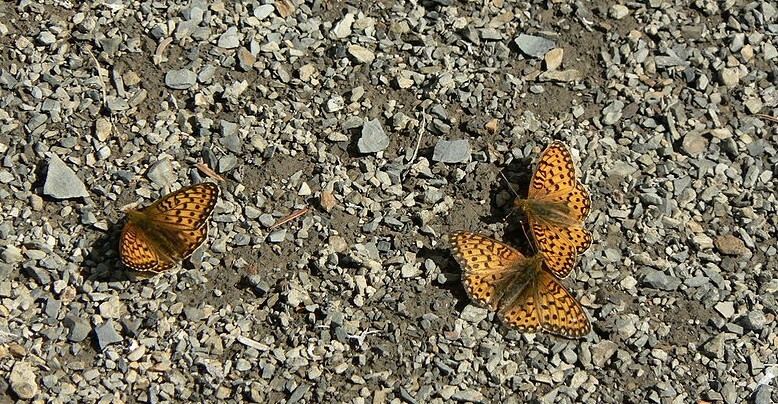 Mormon fritillary caterpillars have an unusual life cycle that makes them especially vulnerable to climate change: their eggs hatch in late summer before snow fall and caterpillars hibernate under the snow pack until spring. Early snow melt can be a false alarm for caterpillars: if they come out of hibernation before the danger of frost has passed, they may perish in a sudden cold snap. Adult butterflies are similarly affected by spring frosts. Females depend on nectar to produce eggs, and early frosts can kill newly sprouted flowers. In years where flowers are scarce and butterflies are abundant, females must compete for food and produce fewer eggs, resulting in smaller butterfly populations the next spring. Boggs has been studying the mormon fritillary for 34 years at the Rocky Mountain Biological Laboratory (where Jessica and Heidi do their field work). She and Inouye wanted to use this long term data set to test whether early warming had an effect on butterfly populations. The researchers combined flower surveys with butterfly population counts from 1980 to 2005, and used this data to build a mathematical model to see whether the number of flowers and the snow melt date in a given year could predict how many butterflies emerged in the spring. They found that the number of flowers per female was a good predictor of butterfly populations the next spring. However, flowers alone didn’t explain the population declines: early snow melt also decreased butterfly populations in the following year through caterpillar mortality. Together, these two factors explained 84% of the variation in butterfly populations. The study showed that climate can affect a species in two ways, indirectly through it’s food chain and directly through temperature stress. Boggs and Inoye were able to detect this pattern because their data set spans three decades. Long term studies like this one are the only way to accurately detect the effects of climate change. Becasue there can be substantial variation in temperature from year to year, it may take decades to understand how slow shifts in climate affect wildlife populations. 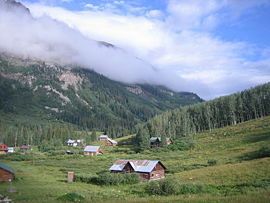 The Rocky Mountains are a particularly important location for climate change research because they are a warming hot spot. The american west is warming 70% faster than the global average, and temperature data from Rocky Mountain Biological Laboratory shows that the average temperature has increases 0.72 degrees F per decade. While that sounds small to a human, it can mean big problems for butterflies and flowers. Find out about new posts first!